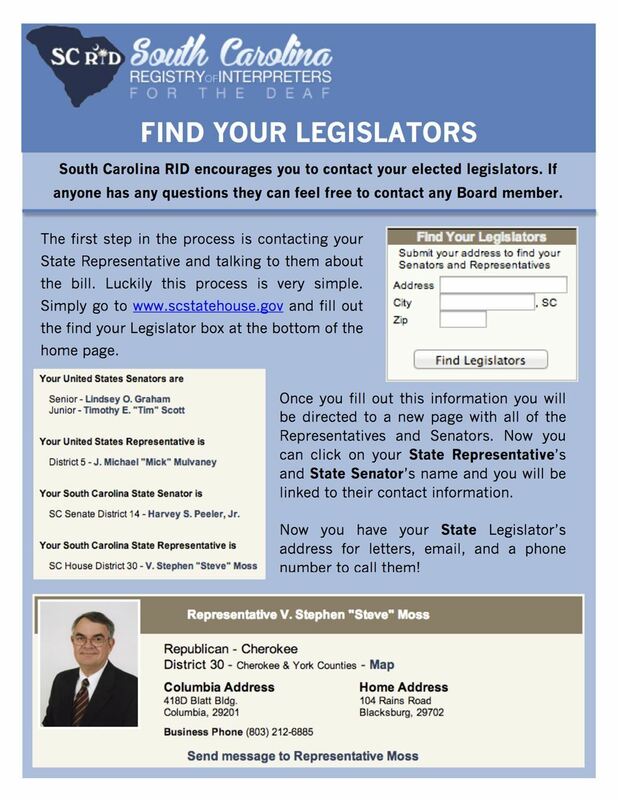 CLICK BELOW TO FIND YOUR LEGISLATOR! Since 2005 the South Carolina Department of Education (SCDE) has recognized the EIPA as the state standard for ‘highly qualified’ under the No Child Left Behind Act. However, the SCDE has not required it. There are many cases where unqualified interpreters are used throughout the state; many having taken only a few sign language classes. This is the same as taking Spanish 101 and 102 and working as a Spanish-English interpreter in a hospital. This endangers the lives and welfare of Deaf people all over South Carolina and there is no recourse for victims of bad interpreting services. Students cannot access public school materials well; fail exams; cannot go to college; and draw Social Security. College students have education paid by SCVR; fail courses; retaking them. Deaf adults often don’t get hired for jobs because of bad interpreting; they stay on Social Security. Imagine being arrested, or hospitalized in Russia. Wouldn’t you want some assurance that the interpreter is qualified? Imagine a Deaf constituent in your district. Wouldn’t you want some guarantee that your speech is interpreted accurately? Many times qualified interpreters are not used because the agency (doctor, hospital, etc.) does not know that the interpreters are not qualified. If a dignitary from China comes to South Carolina to set up a factory in your district, how would you know your interpreter is doing a good job? Would you hire someone who had taken only 2 courses in Chinese? The general public is unable to decide who is or is not qualified. Neither are public schools. Would you want your child to get only 1⁄2 of what is taught in class? Deaf people are often unable to decide who is or is not qualified. They may be able to recognize that the signing looks odd. But, they do not know what they have missed because they can’t hear the person speaking. If you travelled to Mexico, got sick and went to the hospital, how would you know if the interpreter told you everything the doctor said. Ensuring that Deaf children have access to more than 70% of the information is not unreasonable. The Sign Language Interpreters Act requires that sign language interpreters working in specific settings are required to demonstrate a specific level of competence in an effort to protect the public against unqualified, incompetent and unethical practitioners. This act benefits the deaf, hard of hearing and general public by setting standards of qualifications for those who seek to engage in the practice of interpreting and to protect consumers from unprofessional conduct and/or malpractice. The bill has been created to help ensure that effective communication, as protected by the Americans with Disabilities Act and the Individuals with Disabilities Education Act is able to occur whenever a citizen interacts via a sign language interpreter. This Act creates a Sign Language Interpreters Registry under the Department of Labor, Licensing, and Regulation requiring sign language interpreters working in state government, public institutions of higher education, law enforcement entities, hospital systems and in the judicial department to hold nationally recognized certification. This Act also creates a Sign Language Interpreters Registry under the Department of Labor, Licensing, and Regulation requiring sign language interpreters working in a public school district to hold an Educational Interpreter Performance Assessment (EIPA) level of 3.5 or higher, successful completion of the EIPA written test, and a sworn statement to abide by the EIPA Code of Professional Conduct for Educational Interpreters.